Historically I have been a semi-involved hunter, however anyone honest with themselves will note there are less expensive ways to eat meat, but those adventures proved I could still hunt. Where I gravitated toward historically was target shooting and plinking. I remember I used to be able to hit our 1.5" wide mail box pole from our deck about 250 yards away with my pellet gun and have been known to shoot at that distance with a revolver. There are definitely far better shooters than I, however I would clasify myself as a decent shot. I Am I not the geeky nerdy accuracy type with the, "got the leather Olympic shooting jacket", but I have always focused on accuracy when purchasing a firearm. Full disclosure I was a Thompson Center Contender owner, so yes I am a little nerdy about accuracy. Only recently, [cough - due to the uncertainly of certain politicians currently in office], I figured it was now or never to purchase a type of firearm I had never really considered before... an AR military style rifle. The problem was that in my mind a .223/5.56 really isn't that practical... it sure as hell isn't a squirrel or deer rifle. I suppose if you have a huge rat or gopher problem it would be fun, but isn't typically what's in my sights, so that brings us to a .308. The .308 is a caliber well regarded as an effective short and long range hunting round for any game living in North America. The .308 is also a common round that is on the lower cost of the big game rounds. Recently I picked up 1000 rounds of steel cased surplus .308 for $350 or $7 per 20 rounds which is stupid cheap for ammo. OK you get it .308 ammo can be inexpensive to shoot, readily available on almost every gun shelf, but most importantly the .308 is known for some of the most prolific accuracy records held out to 1000 yards. Oddly I decided on the .308 caliber before I decided on the firearm and then I went shopping. At first I was pretty excited over Reminton's Camo wrapped AR 308 rifle, but for the money it really was just a rebranded DPMS rifle for an extra $500. 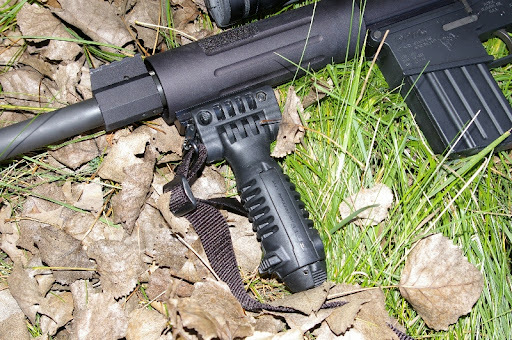 In my value vs accuracy oneline queries, DPMS kept coming up over and over as one of the best rifles for the money so then it became a question of which DPMS 308. 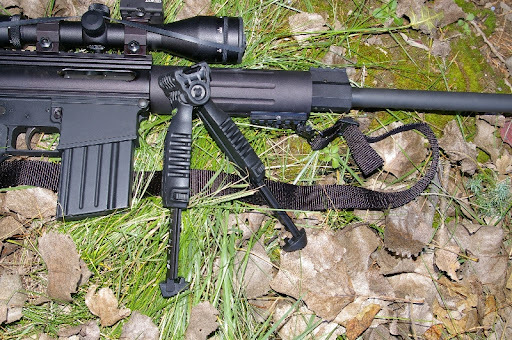 Ultimately I chose the short Bull Barreled 308B model which provided tacticle mobility (in the woods) and still provided heavy barreled accuracy - it has been a good compromise. 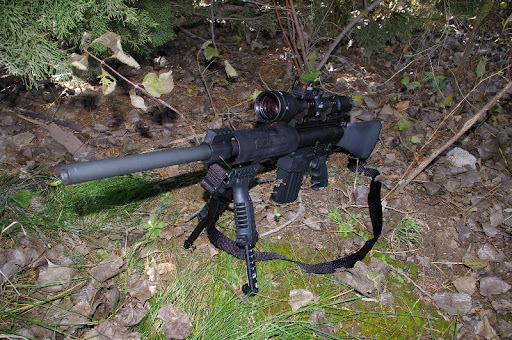 Right away I added a Burris Fullfield Tacticle Varible power 4X-14X scope with Burris's own Xtreme billet tacticle scope mounts. Everyone kept telling me that it's a good idea to have 1x powered scope for those surprise close up shots under 100 yards so I picked up the Burris Extreme Picatinny top ring mount and FastFire II Red Dot Reflex Sight. Here are a few 100 yard groups I fired. The "A" groups were slow fire about 1 per second. The other groups were seeing how fast I could get on scope and on target. As you will notice I decided my hostage targets were also fair game. 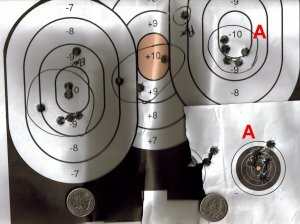 I have definitely done better, but these 1"-ish 1 MOA groups seem to both pretty easy and normal. Handloads really bring the groups in tight to a sub-.75MOA group on occasion, but I am still battling the really crappy stock trigger an am hopeful a new trigger job will reduce my groups as well. The old dude next to me with a DPMS 308T and a target trigger was banging out series of 1/2-3/5MOA groups and said a target trigger job made all the difference.